According to legend, Samhain, the ancient Celtic Festival that we now call Halloween, originated here in Co. Meath in the Boyne Valley more than 3,000 years ago. 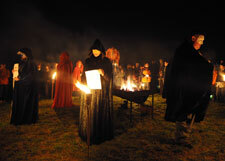 Samhain was a fusion of pagan and Christian beliefs, said to mark the harvest and the end of the old Celtic year and the beginning of the New Year, and where the spirits of the dead passed on to the next world, invoking the Christian idea of resurrection too. 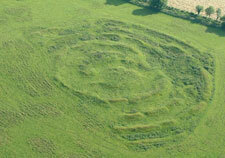 According to one of the early chroniclers of Ireland, the Samhain festival began on top of the hill of Tlachtga, now called the Hill of Ward, one mile east of Athboy, Co. Meath. The druids believed that Tlachtga was closely linked to the spirit world and it was from here that the sacred Samhain fire of the new year was lit and carried to seven other hills around the county including Tara, Loughcrew and then on to light up Ireland’s Ancient East and beyond. Recent archaeological excavations at Tlachtga suggest this ancient hill was indeed used for feasting and ceremonies, and to this day the Boyne Valley has remained the home of Halloween. Spine-tingling fun awaits for young and old alike in the Spirits of Meath festival, enter if you dare! For details of all Spirits of Meath Halloween Festival events check outwww.spiritsofmeath.ie/events or download the Official Discover Boyne Valley App.